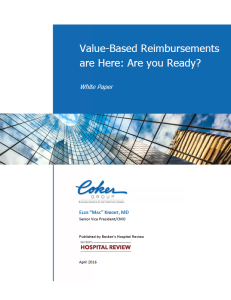 Value-Based Reimbursements are Here: Are You Ready? Many healthcare executives remain reluctant to prepare adequately for value-based payment models. The prevalent attitude continues to be that somehow “this too shall pass.” Thus, expending the time and resources to re-tool the care delivery enterprise so that it functions as well in a fee-for-value reimbursement environment as it has in a fee-for-service reimbursement environment doesn’t seem to be worth the effort. This paper outlines several payment changes in the current marketplace. Also, it addresses what healthcare executives need to do to manage through these payment changes and remain successful in a more value-based care delivery model.